I recently held a wine tasting that included some wines from the French region of Alsace. This AOP is unique in France, in that it is the only region to put the grape variety on the label. This has to do with the heavy German influence in the area. Germany traditionally has labelled wines by the variety. France on the other hand, has always labelled by the growing region. So, when you purchase an Alsace Riesling, you know you are getting a Riesling. And, when you buy a bottle that says Pinot Blanc, you are getting…..well, maybe not what you think. 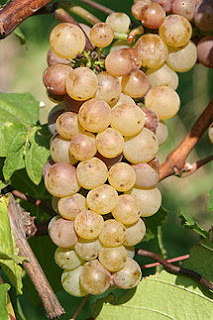 Pinot Blanc is a genetic mutation of Pinot Noir. Pinot Noir is an unstable grape variety that can easily mutate. When it mutates and produces white grapes, it is known as Pinot Blanc. It can also mutate in a grayish-blue colored grape that is known as either Pinot Gris or Pinot Grigio (if you are in Italy). 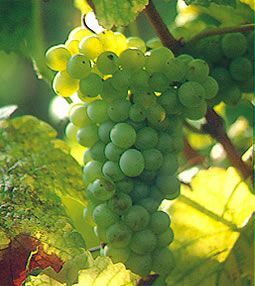 In Alsace, Pinot Blanc is not considered a "grand cépage" or “great grape”. Its’ main use is in Edelzwicker (a blend of grape varieties) and Crémant (the name for sparkling wine, outside of Champagne). If a wine is labelled as Pinot Gris, in Alsace, then the bottle will contain 100% Pinot Gris. When a bottle is labelled as Pinot Blanc, the story is different. It is confusing. The designation for Pinot Blanc, in Alsace, does not necessarily mean that the wine is 100% Pinot Blanc. Matter of fact, it could be 100% Auxerrois, and still be labelled as Pinot Blanc. The difference is that Pinot Gris is a "true" varietal designation in Alsace, or “grand cépage”. The designation for Pinot Blanc means that it is a white wine made from Pinot varieties. 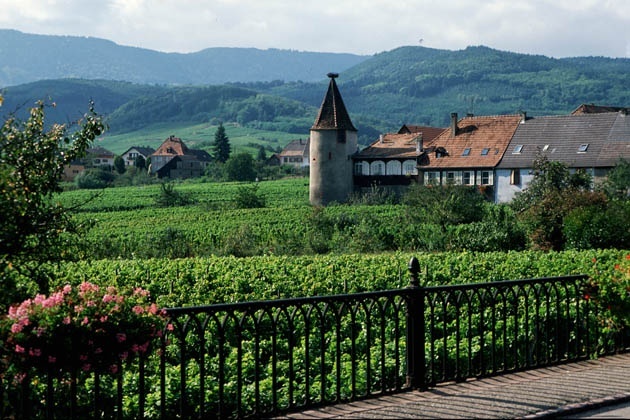 Under the Alsace appellation rules, the varieties can include Pinot Blanc, Auxerrois, Pinot Gris and even Pinot Noir (as long as it is vinified white, without skin contact). The most common Pinot Blanc blend is Pinot Blanc and Auxerrois. The reason why Pinot Blanc and Auxerrois are treated together is that legally, Pinot Blanc is a term that includes Auxerrois (but not the opposite). If you want 100% Pinot Blanc, then the label might state “Clevner” or “Klevner”. Auxerrois is a white grape. DNA testing has shown that it is a cross between Gouais Blanc and Pinot Noir, the same ancestry as Chardonnay. Auxerrois has more body than Pinot Blanc. It is generally lower in acid (except when grown in the cooler northern region of Bergheim, where it develops a crisp character), and has a nice citrus flavor. But, it is mainly known for its’ spicy, smoky, and almost perfumy character. Almost always, Pinot Blanc wines are a blend of Pinot Blanc and Auxerrois. The fresh acidity of Pinot Blanc melds with the spicy, full-bodied character of Auxerrois. The final product produces a wonderful balance. While the nose is not as fragrant as some of the more famous wines of the region, these dry white wines make for great sipping wines, as well as the perfect accompaniment for food. It is perfect on the buffet table, and goes well with everything from smoked salmon, to Thai and Italian dishes. 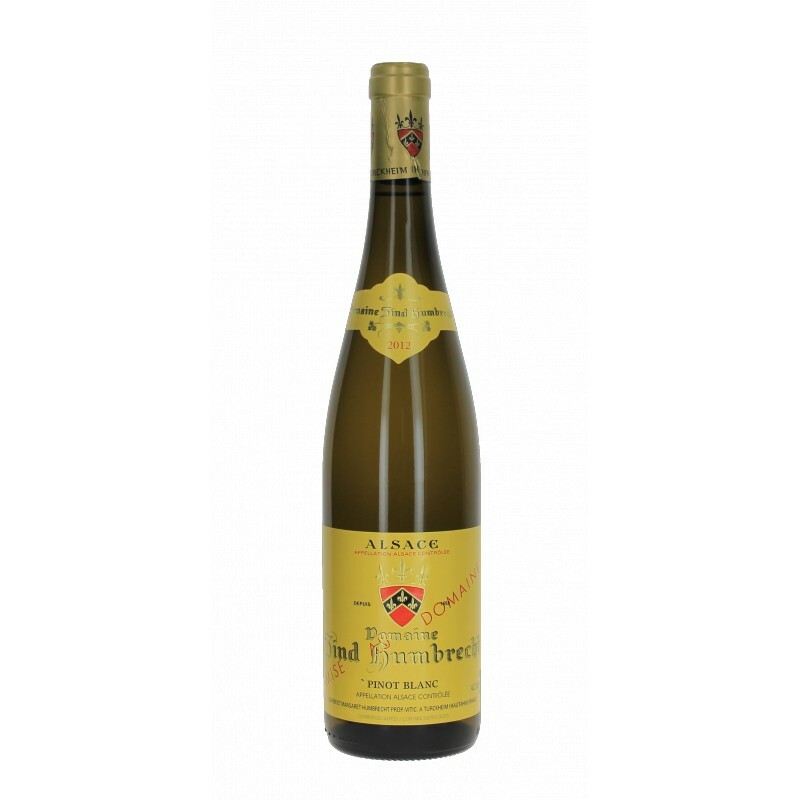 Alsatian Pinot Blanc is one of those wines that you can drink right away, or even cellar for a few years. It holds up well, but not as long as Riesling or Chardonnay. The night of the tasting, I served the 2013 Zind Humbrecht Pinot Blanc. This blend was 65% Auxerrois and 35% Pinot Blanc, and was picked as one of the nights’ favorite wines. If you are looking for something that is different from the everyday Chardonnay, or the lighter Pinot Grigio, give Pinot Blanc from Alsace a chance, Surprise your friends with your knowledge about why the bottle says one thing, but what is inside is another. Have fun, and enjoy. Okay, so the title of this blog is a play on words, but you get the idea. What is the sixth most planted grape in the world? 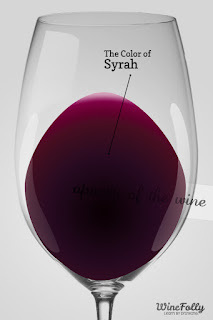 Syrah. Aren’t familiar with it? How about Shiraz? 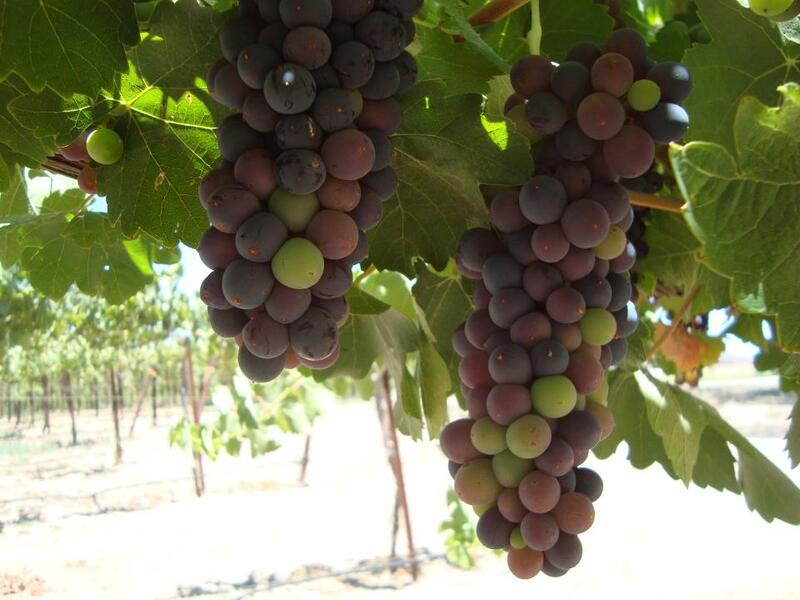 New wine drinkers are surprised to learn that these are the same grape variety, and also further surprised to learn that Petit Sirah is a completely different grape. Syrah is considered one of the "noble grape" varieties. The following is an abbreviated version of a textbook chapter I wrote for a new wine education program (hopefully to be announced soon in North America). Syrah has been popular, and highly esteemed in France since the 18th century. 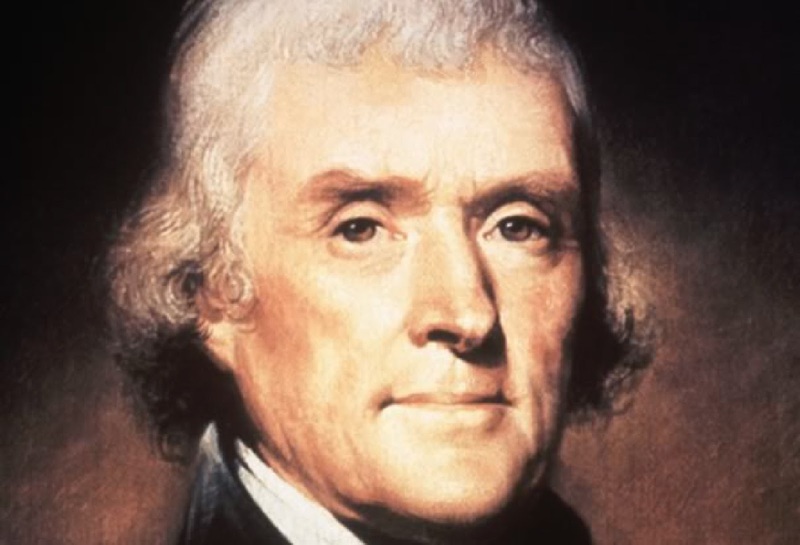 Thomas Jefferson, the third president of the United States, raved about the wines of Hermitage in his diary. In fact, in the early 1800′s, Hermitage was the most expensive wine in the world. The Shiraz name is also not particularly new either, as it has been grown in Australia since the early 1830’s. There are stories of the origins of Syrah. Stories about the grape originating in Persia, or that the Romans planted the fruit in Vienne (now known as Côte Rôtie). 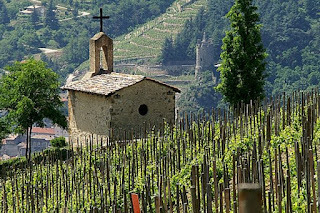 Some of the more romantic stories include the vine being planted on a hill by a lone monk, on his way to the Lérins Abbey by the sea. 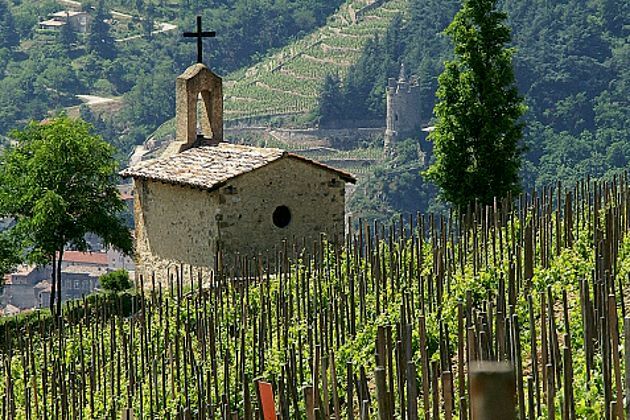 The little chapel dedicated to St. Christopher on the hill of Hermitage lends some credence to the story that a hermit, Gaspard de Sterimberg, planted the vine as he returned from the crusades in the 13th century. But, recent research indicates the grape is a native of the Rhône valley, in France. 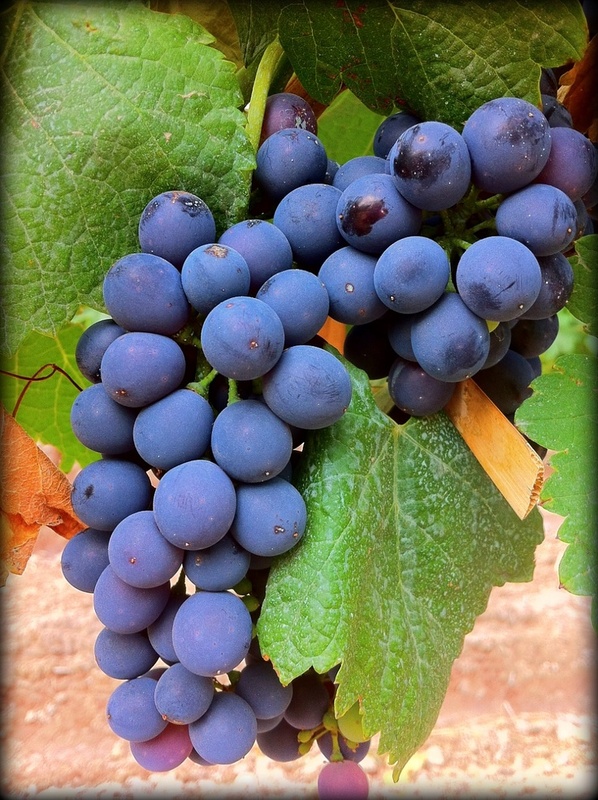 DNA research has determined that Syrah is an offspring of two ancient varietals: Dureza, and Mondeuse Blanc. 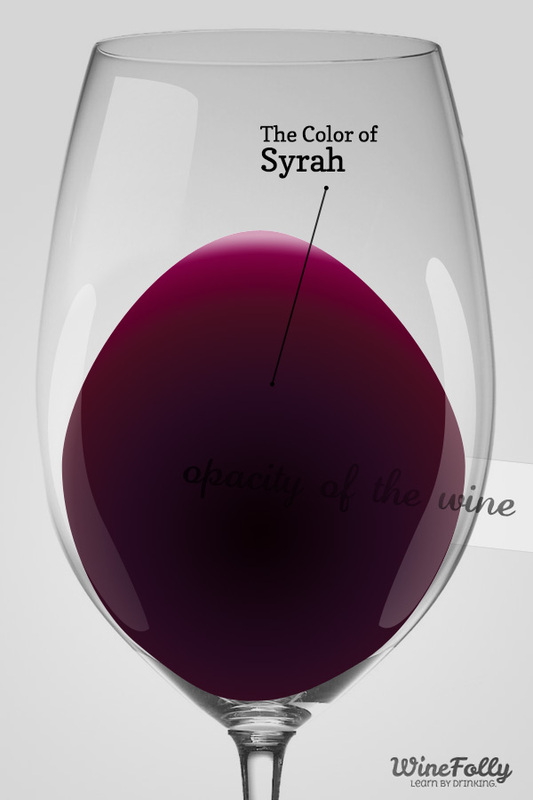 Syrah is the red wine grape that rules the Northern Rhône Valley, in France. Syrah Grapes are the only red grape allowed by AOP rules in the appellations. In the small appellations of Côte Rôtie, Hermitage, and Cornas, Syrah grows on often steep, dry slopes and terraces to produce densely concentrated wines whose longevity and complexity in maturity rival the finest wines of Bordeaux. While Syrah is usually associated with the Northern Rhone, it is increasingly important in the southern Rhône Valley where the grape provides structure, color, and aroma to the Grenache-based wines of Châteauneuf-du-Pape and Gigondas, as well as the vast Côtes du Rhône designation. It is likely that more wine drinkers know Syrah by its Australian name, Shiraz. Shiraz is the same grape as Syrah, and was imported by Australian settlers in the 1830’s. The Australian approach to Shiraz is more diverse than it is in France. The grape is used to produce everything from fortified, Port-style wine (“stickies”), to red and pink sparkling wine, and mass-produced "critter" wines. Now, the name “Shiraz” has been associated with a crisper, fruitier style of wine. It is not uncommon a winery to label one wine a Syrah and the other a Shiraz, dependent on the style. Outside of France and Australia, Syrah has met with great success, the most notable area being in the United States, but particularly in California. The first plantings of Syrah in California took place in the Napa Valley in 1878. The big jump in California production took place in the late 1990’s, when the “Rhône Rangers”, in the Central Coast, stimulated interest in the variety. By 2000, more than 90 wineries had joined the movement throughout the United States, but mainly focused on California’s North and Central Coasts. One of the factors influencing the interest of Syrah plantings around the world is the relative ease with which the grape grows. It is a vigorous vine, and needs trellising and training for the best returns. The yields go hand in hand with quality. Lower yields produce concentrated, long lived wines, but even at high yields, Syrah retains some of its character and can make attractively fruity wines. A quote often used by grower is, “Syrah likes a view”. This is very evident in the traditional growing area, where the vineyards are planted towards the top of hills. Due to erosion, there is less soil at a higher altitude, causing the vines to produce fewer grapes. Lower yields tend to produce more concentrated wines. Syrah wines display medium to high tannins (although they are typically ripe and smooth, not abrasive like younger reds can be), moderate acidity, medium to full body, with rich round flavors. Depending on the quality of the fruit, they can range from brawny to soft. The concentrated pigments lead to very deep-colored and concentrated wines that, in youth, typically display opaque, inky-purple or black cores. Wines produced from high-yielding vines, however, may lean toward ruby cores, even in youth. Photo courtesy of Wine Folly. On the nose, the finest northern Rhône Syrah offers a rich mix of black and red fruits, especially raspberry, blueberry, blackberry, plum, and blackcurrant. For such a dark red wine, it is somewhat surprising to find that the fruit aromas are often accompanied by floral notes of violets and carnations. Additionally, vegetal aromas of tobacco, black pepper, licorice, cloves and rosemary, can be found in quality examples. For many tasters, it is the savory side of Syrah, produced through the interaction of wine and barrel, that provides the most telltale signs for Syrah…bacon, or meat. Warmer climates bring out the mellower flavors of plum, while cooler temperatures spice up the wine. New world versions of the grape tend to emphasize the primary fruit aromas of raspberry, blackberry, and plum in a fruity style, which many "sweet" wine drinkers enjoy. Australian Shiraz often adds a suggestion of chocolate and mint or eucalyptus on the nose. With age, it can take on an appealingly gaminess and leather bouquet, along with an almost chocolate-like character. Syrah has the ability to age and evolve for years or multiple decades in the best cases. Hermitage and Côte Rôtie have the reputation for the slowest maturing of the Rhône wines. Other regions of the Rhône are at their best between three and eight years. The blended wines of the southern Rhône need less time than the north, and most Shiraz-style wines are meant to be drunk within three to five years. The exception to Shiraz is Grange, which can take decades to mature. Syrah is one of the most versatile wines to pair with food. With its fresh fruits, spice, rich character coupled with the wide variety of styles, it is the perfect wine for all types of game, duck and chicken. Syrah also makes a great wine and food match with braised dishes and stews. 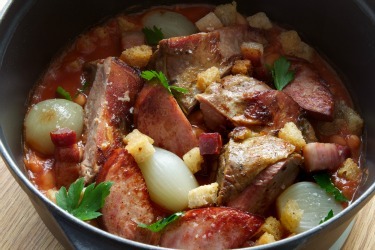 Syrah is for many people the only wine that works with winter dishes like cassoulet, and grilled meats. Cheese Pairings would include Cheddar, Edam, and Gouda. So, who produces your favorite Syrah/Shiraz?